German Hebraist and teacher; born about 1662; died after 1734. He was a teacher in Dessau, and is said by Fürst to be the author of a small dictionary, or rather vocabulary, in Hebrew and Judæo-German entitled "Ḥinnuk Ḳaṭan" (Dessau, n.d.). But it seems that this work, now very rare, was printed in other editions as early as 1658 (Amsterdam) and even 1640 (Cracow) and must therefore be ascribed to another author. 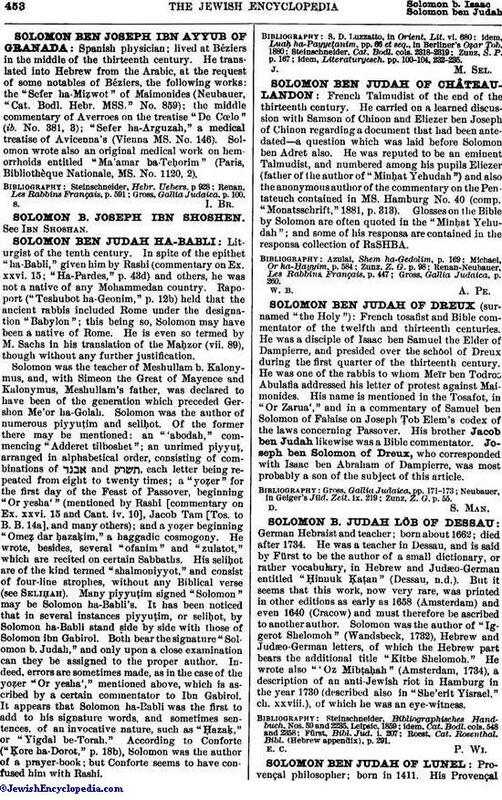 Solomon was the author of "Iggerot Shelomoh" (Wandsbeck, 1732), Hebrew and Judæo-German letters, of which the Hebrew part bears the additional title "Kitbe Shelomoh." He wrote also "'Oz Mibṭaḥah" (Amsterdam, 1734), a description of an anti-Jewish riot in Hamburg in the year 1730 (described also in "She'erit Yisrael," ch. xxviii. ), of which he was an eye-witness. Roest, Cat. Rosenthal. Bibl. (Hebrew appendix), p. 291.